Fiskars Xact Digging spade Medium is a revolution in spade design. It features an extra strong, sharp blade and non slip step board for penetrating hard soil like its larger brother but is designed to fit a smaller user. The same benefit of control and comfort is assured thanks to a broad Push-Pull handle. 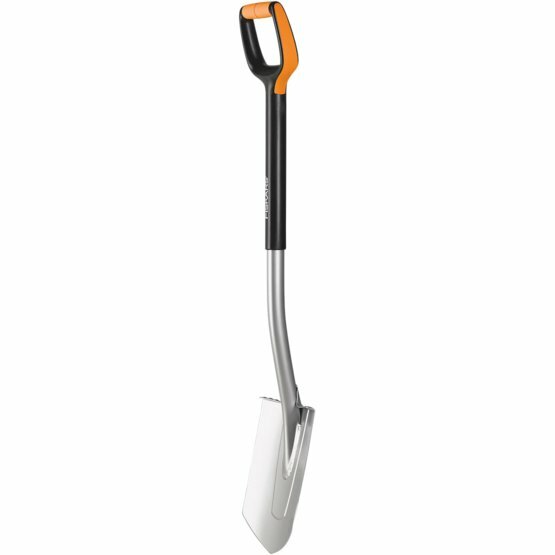 Fiskars Xact Digging Spade Medium is a premium garden tool. The spades which also comes in large size for taller users shares the same new innovative head design made of durable boron steel solidly welded to smart composite and steel shafts for optimized light weight, stiffness and durability. The extra strong, sharp blade with its non slip step board is ideal for penetrating hard soil while its push pull handle gives assured digging control. Best tool for diggin in hard and rocky soil. Pointed sharpened blade with step board cuts easily through soil layers and roots. For height of users 160- 175 cm.